Designed to reflect a Balinese water palace, Grand Hyatt Bali consists of low-rise buildings and villas among 40 acres of landscaped gardens, waterfalls, and lagoons. 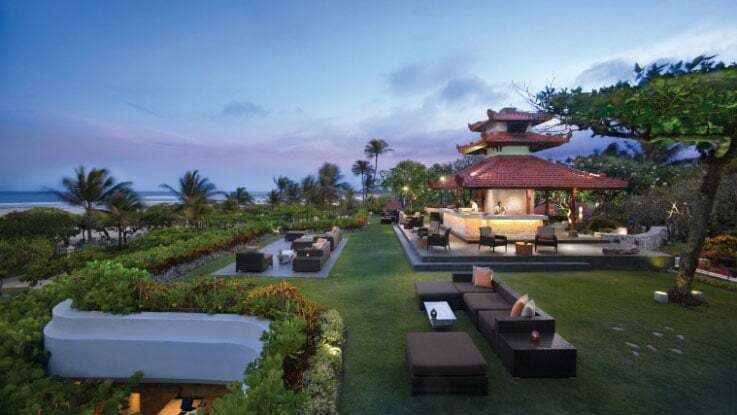 Providing 648 Balinese-inspired guestrooms, the Grand Hyatt Bali is just 12 kilometers from the Ngurah Rai International Airport. The 5-star hotel is set on a magnificent beachfront in the Nusa Dua Peninsula and is close to Sanur, Kuta, and downtown Denpasa. Included among the five swimming pools are a chlorinated river, a quiet Balinese bath, and a 50-meter waterslide. Guests have many excellent dining options available to them, serving Japanese, Indonesian, and Italian cuisine along with a unique food market with stalls providing all sorts of food.